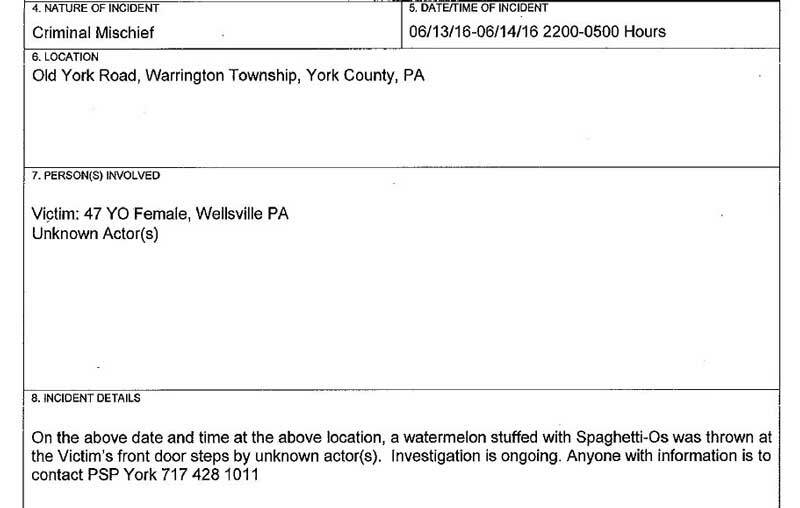 A watermelon stuffed with Spaghetti-Os was thrown at a 47-year-old woman's front steps in northern York County, according to a Pennsylvania State Police. 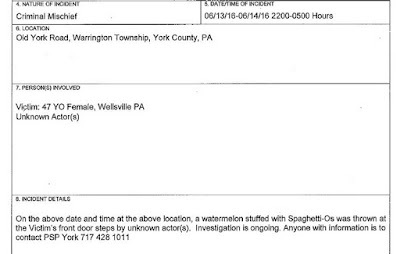 Police said the stuffed watermelon was launched at the Warrington Township home sometime between 10pm last Monday and 5am on Tuesday. The prank is slightly more imaginative than the last time vandals left their mark on her home. "Somebody threw whoopie pies at her front porch over a year ago," Trooper Rob Hicks, a state police spokesman, said. He said police don't believe last week's mischief was related to the whoopie-pie affair and described it as random and isolated. The woman's porch wasn't damaged, Hicks said, and there are no suspects, "just a mess." The motive is unknown, he said. Asked for more details, Hicks said the vandals likely partially hollowed out the watermelon, then poured in the Spaghetti-Os. Anyone with information about the culprits is asked to call police. I'm having a real hard time grasping the logic behind combining watermelons with Spaghetti-Os. Maybe there's a pun we're just too stupid not to get?